Researchers at the University of Maryland and Ohio State University are examining Wii Fit's suitability as "an effective concussion management instrument," in football, where the injury is increasingly a concern. 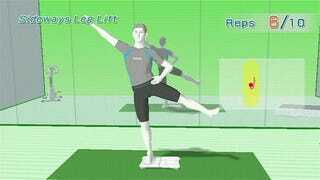 According to a feature published by The Washington Post, injured players are monitored by a balance test using, naturally, the Wii Fit Balance Board. Key to the instrument's effectiveness, the researchers note, is the Wii's status as a video game console. Athletes are less likely to associate it with rehabilitation or acknowledging bad news. "The athletes love it because what we've done is we've incorporated this fun game that they're playing at home into their rehab system," said Tamerah Hunt, director of research at the Ohio State Sports Concussion Program. "But they're also enjoying it at a time when they're injured or at a time when their spirits are down, and they have to come into the athletic training room every day and they have to get all this treatment ... and it's kind of a reaction of, 'Oh, this is fun.' "
At Maryland, the training staff says they're in the third year of using Wii Fit to keep track of players' rehabilitation from cranial injuries.